Here’s my tried-and-true recipe for vegan latkes (potato pancakes, a mainstay for Hanukkah celebrations), in which the grated potato is held together with oatmeal in place of the customary eggs. For a gluten-free version, quinoa flakes work splendidly. A small amount of grated carrot adds extra color and flavor. Adapted from Vegan Holiday Kitchen. Photos by Hannah Kaminsky. This recipe makes 3 to 4 dozen latkes, depending on size. Here's my tried-and-true recipe for vegan latkes (potato pancakes, a mainstay for Hanukkah celebrations), in which the grated potato is held together with oatmeal in place of the customary eggs. This recipe makes 3 to 4 dozen latkes, depending on size. In a heatproof bowl, combine the oats or quinoa flakes with 1½ cups boiling water. Stir and set aside while preparing the other ingredients. To fry: Heat just enough oil to coat the bottom of a large, nonstick skillet or griddle. Drop enough potato batter to form 2½- to 3-inch pancakes. Fry on both sides over medium-high heat until golden brown and crisp (alternatively, see baked variation following). 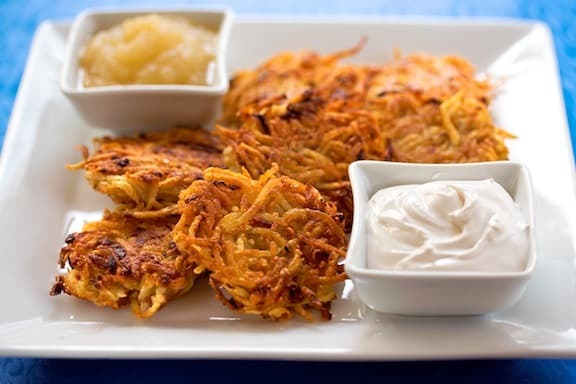 To bake: See Baked Latkes variation below recipe box. Drain briefly on paper towels and place in a covered container to keep warm until serving. Serve warm with applesauce and the optional sour cream. For the potatoes, use golden or red-skinned. Peel them or not; if leaving unpeeled, use organic potatoes and scrub well. Since the definition of “medium-large” potatoes can vary, if you find that the cooked oatmeal mixture isn’t enough to give the grated potatoes a nice even coating (or if the latkes don’t stick together), cook a little more oatmeal or quinoa flakes, starting with 1/4 cup additional grain and 1/2 cup additional boiling water. And of course, use the quinoa flakes as the gluten-free option, both in place of the oatmeal and the matzo meal. 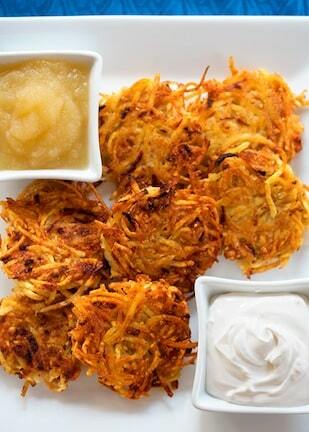 Sweet potato or zucchini latkes:Replace one or two of the potatoes with sweet potato. Or, replace one or two of the potatoes with one or two medium zucchini. Baked latkes: Preheat the oven to 425 degrees F. Stir 3 to 4 tablespoons of high-heat oil such as safflower into the potato mixture. Line two baking sheets with baking parchment. Use a round 1/4-cup measuring cup to drop the potato mixture onto the parchment, then flatten lightly with the bottom of the measuring cup. Bake for 10 to 15 minutes, or until golden brown on the bottom, then flip carefully with a spatula. bake for 10 to 12 minutes longer or until the golden-brown on the second side. Try substituting flax meal for the matzo meal, and I have been frying in grape seed oil. Jenny, I haven’t tried baking it, but coincidentally, just today I thought I’d try. 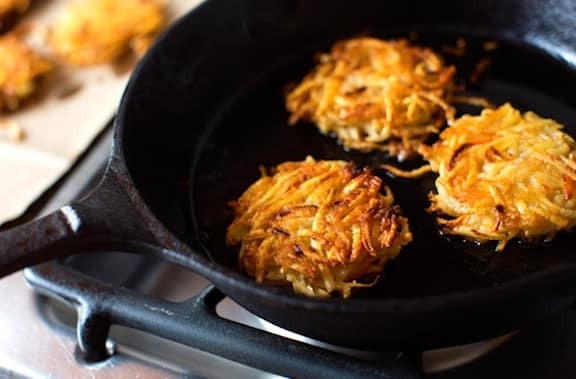 I would put the latkes on a baking sheet lined with baking parchment, spray them with a bit of olive oil cooking spray so they’ll crisp up, and flip them after about 15 minutes (at 400 degrees). If it works out as I think, I’ll post this variation. Happy Hanukkah to all! Just made it by baking it, it was delicious and my whole family enjoyed. thank you! Jenny, I also made them baked and really liked it — it was easier and less oily than the traditional fried kind. I’ll add the baked variation to this recipe, as it was a keeper! That sounds like a fantastic way to make them, Elizabeth. I recently started to bake the latkes and it’s so much easier and cleaner. Happy holiday! How long will these last? I am doing two channucah parties, two days apart, )and quite fancy getting all the work out of the way in one go! Hi Ruth — I think that especially if you make the baked version, you can do it all in one go. Then just pop them into hot oven for a few minutes until they crisp up. Happy holiday! Last year made them with quinoa and fried and they were okay, but tonight I made them with GF oats, GF matzo, and baked them and they were wonderful. Thanks, Sara. I too, now prefer baking them and since GF isn’t a concern for me, I use regular oatmeal. Glad these were successful for you! the applesauce is on the stove in a pot. now I’m onto the latkes. I was getting ready to use the quinoa flakes – since you recipe for matzoh brie was fantastic. but it seems (?) like everyone and you prefer the oatmeal. what do you think?? also, what about using a food processor for the potatoes. how about not peeling?? Hi Lena — both the oatmeal and quinoa flakes work well; it’s a matter of preference, though I do think the oatmeal is a slightly better “glue.” Of course, a food processor makes the whole process easier. Not sure how or why I left that off it has been added. I did specify that the potatoes can be scrubbed rather than peeled. Hope you enjoy these, and happy Hanukkah! oh my gosh!!! I’ve been a vegan for 27 years. latkes have never been the same. until now!!! these are delicious!!! I made them with oatmeal and baked. absolutely yummy. oh, and the applesauce..the best!!! Yum!yum!yum!!! I’ve been a vegan for 27 years. Potato pancakes have never been the same. I used oatmeal and baked them. These are delicious!!! Hubby has a stomach ache from eating too many!!! So glad this worked out so well for you, Lena! I can’t wait to make my batch this weekend. I’m hoping to make the baked version as a surprise for my husband tonight. I’m wondering if you make this without squeezing the liquid out of the grated vegetables? Most recipes I see call for wringing out as much “juice” as possible, and some say to let the potato starch that’s extracted settle, then add that back in. Love the idea of not using flax meal or a commercial egg replacer! Hi Patsy, I find that if I make the batter and bake right away, it doesn’t get all runny and liquid-y. I just made a big batch the other night with no problem!I hope these work out for you and that you and your hubby enjoy them. Made them this evening and they came out delicious. Very easy to make, especially when using the food processor. Thanks for the recipe, Nava! Can one substitute quinoa flour for quinoa flakes? Thank you for this fabulous recipe. I used a beet instead of a carrot and baked the latkes. They were the best I’ve ever tasted and so simple and quick to make. YUM! Gotta be honest, these were fantastic! …I got a little bit carried away and ended up spreading avocado on top of them with a slice of dill pickle… Amazing. Just wondering.Can the entire recipe be made with zucchini or would that be too overwhelming? Also, if so, how many grated cups of zucchini does 2 medium zucchini translate to? Someone brought me a very large one from their organic garden. Claudia, you could give it a try. This would be a good use of your zucchini! Try not to use the seedy part. Since “medium” is also subjective, it’s hard to say how many cups it would translate to. Does this work with Russet potatoes? Lisa, russet potatoes work very well for this recipe. Enjoy! So delicious!!! Thank you for the recipe, and Happy Hanukkah. Thank you, Tracie, and same to you! One cup of shredded potatoes equals about one potato, so I just combined 6 cups of potatoes with 1.5 cups of prepared oatmeal and it was perfect! Thanks again, and happy holidays!